The popularity for nut milks just doesn’t seem to stop growing! And it is for good reason, so simple to make and a great alternative to dairy for raw foodies, vegans and those with dairy allergies. It’s so tasty we even know of people who regularly consume dairy, now prefer to have nut milk for their diet instead of cow’s milk. 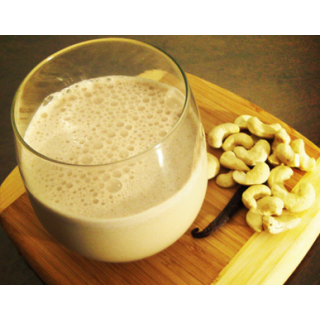 If you liked our Raw Almond Milk, you are going to love this! Soak the cashew nuts for at least 12 hours. Drain the water after soaking. 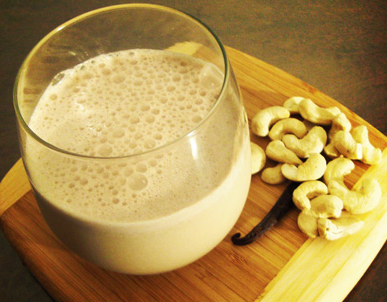 Put the cashew nuts into a blender. Add into the blender the remaining ingredients of vanilla bean powder, dried dates and water. Blend everything together until it is creamy. If you can wait (!) put in the fridge as best served cold.